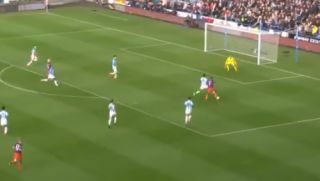 Manchester City star Raheem Sterling was denied what looked a clear penalty against Huddersfield this afternoon, leaving many fans on Twitter stunned. While the England international has a bit of a reputation for going down easily, there seems no doubt about this decision – and it’s the wrong one. City went ahead through Danilo not long afterwards anyway, but some fans were far from impressed with the referee here, accusing him of Liverpool bias. @GNev2 ref is a Liverpool fan with Huddersfield 1st goal on Acca ?? Wtf the ref must be a liverpool fan. How is that not a penalty? Ref a Liverpool fan?? Stonewall penalty? ?